I first heard Chile's Thornafire when I encountered their debut album, the colorfully titled Exacerbated Gnostic Manifestation, while shopping at Lou's Records on my way back from San Diego a few weekends ago. Since there aren't any listening stations, Lou's has a policy of allowing customers to take used CDs into their cars to listen before they buy. Oh man, great idea. Exacerbated was tailor-made for car trips. Its bulletproof death metal riffs and blasts drive relentlessly forward like recent Krisiun, with just enough Morbid Angel groove to halt the speedometer from reaching CHP-alerting levels. Their cogent anti-Christian critiques even yield a few choice, blasphemous sing-alongs. Sing it with me: "If a Jew doesn't worship a human being / How can a man be son of his God?" Bassist Alexis Muñoz pulls a reverse-Enslaved maneuver, roaring all the lyrics to Vorex Decontrucción in the band's native language after an album in English. The musical language has changed in small but noticeable ways, too. Everything is bigger this time around: synthesized strings and horns that bolster the guitars, richer melody in the guitar lines, more mace-swingingly chunky riffs organized more creatively. It's produced for impact, not just volume, and there's color to these songs. You know. Black. "En El Eon De Las Falacias"
There are some extra-musical corkers, too: on "Confesión," actress Maria Araya recites the words of Úrsula Suárez, a 17th/18th century Chilean nun forced by church confessors to recite her deranged, proto-feminist visions. And then right before "De La Destrucción Al Trono" comes a sample from an early '09 interview with controversial Catholic Bishop Richard Williamson, who denies the existence of Holocaust gas chambers. Thornafire's style is still pretty conservative as death metal goes, yeah, and it treads well-worn paths of anti-Christian ranting. 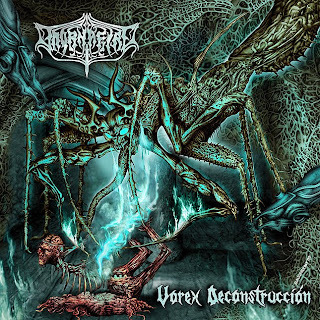 But Vorex Decontrucción is far more vivid than your average modern death metal record. And clearly there's still plenty to rant about. I didn't think the songwriting was all that great, but not a bad album. REALLY EXELLENT BLOG! THANKS A LOT!